The past year has seen scores of changes, large and small, in the law of China taxation. 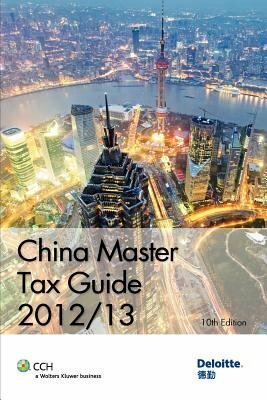 And, like every other year in the last decade, CCH's always-welcome China Master Tax Guide has them all covered. Providing an overview of the Enterprise Income Tax Law and other tax laws, their application, and the changes - effective, pending, and proposed - that have arisen during 2011/2012, this 10th Edition has all the clear, easy-to-use guidance you'll need on new tax treatment in nearly every realm of tax practice, including: VAT reform pilot program in Shanghai; preferential policies for software and integrated circuit producing enterprises, high and new technology enterprises and enterprises established in the Western region; latest update on advance pricing agreements statistics; new social security law; advance ruling for customs valuation; and numerous revisions in specific areas such as VAT incentives, stamp duty exemption, self-reporting procedures for individual taxpayers, calculation of tax on bonuses, tax rates and range of applicable taxable income for wages and salaries, settlement of tax by employer, valuation of fixed assets, and much more. With its hallmark step-by-step guidance and graphic treatment of procedural detail, CCH's China Master Tax Guide 2012/13 lays out the latest law of China taxation in transparent, non-academic English. The Guide is expertly authored and updated by the professionals at Deloitte Touche Tohmatsu, who use their on-the-ground experience to make the book truly useful for day-to-day work.